Official artwork of the Great Fox from Star Fox: Assault. The Great Fox (グレートフォックス, Great Fox) is the mother ship belonging to the Star Fox mercenary group. The Great Fox from Star Fox 64. The Great Fox is a giant ship that has four large wings. In the front of the ship is a port that allows Arwings to enter and exit the ship. The front of the Great Fox has two turrets that fire high-powered energy blasts. The Great Fox serves as the base of operations for every one of Fox's team adventures since Star Fox 64, and it serves purposes ranging from launching and carrying the Arwings to having ROB 64 send Fox supplies. The Great Fox appeared in Super Smash Bros. in the Star Fox 64 stage Sector Z, where the Great Fox acts as the platform on which the players fight each other. The players can only traverse the ship length-wise. 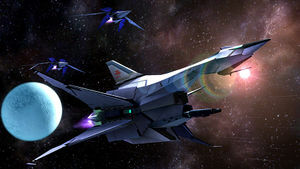 The ship is greatly scaled down (or the fighters are greatly scaled up), as normally, the entire Star Fox crew can fit comfortably in the cockpit, and the ship can store several Arwings and other large vehicles. The ship also is shown very briefly in the game's intro, before the camera zooms into the bridge to show Fox. The Great Fox as it appears in the intro of Super Smash Bros. The Great Fox as the main platform in Sector Z. The Great Fox serving as a platform in Corneria in Melee. The Great Fox in the opening to Super Smash Bros. Melee, along with Samus's Gunship and the Blue Falcon. In Super Smash Bros. Melee, the Great Fox is again reduced to a smaller, unrealistic size. It is featured on two stages. In Corneria, the Great Fox acts as a platform as it did in Super Smash Bros., whereas the players traverse lengthwise, while in Venom, the player traverses the ship's width as it flies over the planet Venom from Star Fox 64. Its four wings become usable as platforms; the top two can be passed through. It again appears in the intro in Melee, shown along with the Captain Falcon's Blue Falcon and Samus Aran's Gunship. Great Fox trophy in Melee. The Great Fox flying in the background of Lylat Cruise in Brawl. Corneria returns from Melee as a stage in Super Smash Bros. Brawl, where it again serves as the main platform. 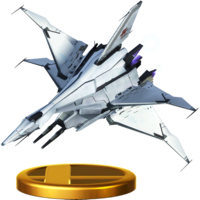 In terms of new stages, the Great Fox gives up its role as a platform in the new Star Fox stage, Lylat Cruise, ceding it to the Pleiades. It still zips by in the background, however, and is also featured in the Subspace Emissary. The Great Fox briefly engages the Battleship Halberd in a dogfight over a giant wasteland. Shortly afterwards, it is defeated and carried off on the underside of the Halberd before being slammed into the Glacial Peak; however, what exactly became of the vessel after this remains unknown, as it is never seen after the "Snake's Mission Begins" cutscene, where it seen erratically fleeing the area, its engines heavily trailing smoke. Great Fox trophy in Brawl. The mother ship of Team Star Fox. Its oversized plasma engines let it warp during interplanetary voyages. It carries the team's Arwings and Landmaster in its cargo hold, kept unlocked in case of emergency, and is equipped for emergency Arwing landings. Its two laser cannons can be used to blast asteroids. It's piloted by the robot ROB 64, who also issues directions to the teams. Great Fox (Assault) trophy in Brawl. 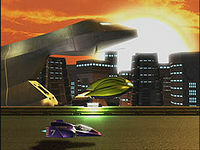 The Great Fox as it appears in Star Fox: Assault, looking more streamlined than in previous appearances. It takes a horrible amount of damage at the hands of the parasitic Aparoid army, and in a last, desperate attack. Peppy crashes it into the Aparoid home world. In the nick of time, Peppy and ROB 64 are whisked to safety. Corneria in Super Smash Bros. for Nintendo 3DS. In Super Smash Bros. for Nintendo 3DS, Corneria returns as a stage once again, and with it the Great Fox. However, the ship doesn't appear at all in the stage's new Ω form. Great Fox trophy in 3DS. The Great Fox falls into several different starship categories, but we'll spare you the complicated jargon and just call it an assault carrier. Using three plasma engines for smooth warp travel, this ship is essential to the resupplying, maintenance, and recuperation of the Star Fox team. The Great Fox can be described as an assault carrier, or as any number of other jargon-heavy terms too complicated to list here. Its three plasma engines allow for smooth warp travel between star systems. It's also an essential supply and maintenance dock for the team, giving them a pace to recuperate between fights. The Great Fox in Super Smash Bros. for Wii U. The Great Fox appears in Super Smash Bros. for Wii U, with its design from Star Fox: Assault, as a main platform in Orbital Gate Assault. It also appears as an item in Smash Tour: when used on the map, it teleports the user to a not yet visited checkpoint. Great Fox (Assault) trophy in for Wii U. The Great Fox can be described as an assault carrier, or we should use any number of other jargon-heavy terms too complicated to list here (or remember). It's the Star Fox HQ and hold their Arwings, Landmasters, and more. Fox's father, James McCloud was the one who has built, and in Star Fox: Assault, it was fully renovated to give it a slick new look. The Great Fox can be described as an assault carrier, or as any number of other jargon-heavy terms too complicated to list here. It's the Star Fox HQ, and holds their Arwings, Landmasters and more. Fox's father, James McCloud, was the one who had it built, and in Star Fox: Assault, it was fully renovated to give it a slick new look. In Super Smash Bros. 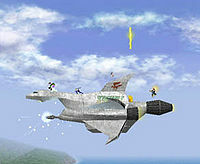 Ultimate, The Great Fox returns as the main platform on the returning stages Corneria and Venom, and again features as a background element of Lylat Cruise. Its updated design in Corneria and Venom appears to be taken from Star Fox Zero. The Great Fox found in the snowy mountain area after the Metal Gear RAY spirit battle. The player needs a Slippy Toad or ROB 64 spirit to repair it. Once repaired, the player can ride in it to explore the space area. The Great Fox being taken down in the Subspace Emissary. Super Smash Bros. for Wii U is the only game where a stage does not take place solely on the Great Fox. Despite this, the Great Fox does make an appearance as a stage platform in every Super Smash Bros. game to date. This page was last edited on March 17, 2019, at 01:16.